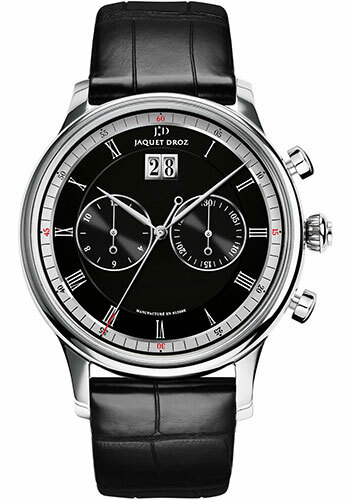 43mm stainless steel case, 13.91mm thick, transparent back, stainless steel bezel, scratch resistant sapphire crystal, black dial, caliber 6885 self-winding movement with centered hours, minutes and chronograph seconds chronograph hours counter at 9 o’clock chronograph minutes counter at 3 o’clock big date at 12 o’clock, approximately 40 hours of power reserve, black alligator/crocodile leather strap, stainless steel folding clasp buckle. Water resistant to 50 m (150ft). 43mm 18K rose gold case, 13.91mm thick, transparent back, 18K rose gold bezel, scratch resistant sapphire crystal, black dial, caliber 6885 self-winding movement with centered hours, minutes and chronograph seconds chronograph hours counter at 9 o’clock chronograph minutes counter at 3 o’clock big date at 12 o’clock, approximately 40 hours of power reserve, black alligator/crocodile leather strap, 18K red gold folding clasp buckle. Water resistant to 50 m (150ft). 43mm 18K white gold case, 13.91mm thick, transparent back, 18K white gold bezel, scratch resistant sapphire crystal, ivory dial, caliber 6885 self-winding movement with centered hours, minutes and chronograph seconds chronograph hours counter at 9 o’clock chronograph minutes counter at 3 o’clock big date at 12 o’clock, approximately 40 hours of power reserve, black alligator/crocodile leather strap, 18K white gold folding clasp buckle. Water resistant to 50 m (150ft). 43mm 18K white gold case, 13.91mm thick, transparent back, 18K white gold bezel, scratch resistant sapphire crystal, black dial, caliber 6885 self-winding movement with centered hours, minutes and chronograph seconds chronograph hours counter at 9 o’clock chronograph minutes counter at 3 o’clock big date at 12 o’clock, approximately 40 hours of power reserve, black alligator/crocodile leather strap, 18K white gold folding clasp buckle. Water resistant to 50 m (150ft). 43mm PVD case, 13.91mm thick, transparent back, PVD bezel, scratch resistant sapphire crystal, black dial, caliber 6885 automatic movement with centered hours, minutes and chronograph seconds chronograph hours counter at 9 o’clock chronograph minutes counter at 3 o’clock big date at 12 o’clock, approximately 40 hours of power reserve, black alligator/crocodile leather strap, stainless steel folding clasp buckle. Water resistant to 50 m (150ft).